So Mig’s unhappy. Personally in a grump? Grumping for pay? A mixture of the two? Is there any distinction any more? Who can say? One thing’s for sure, though. Mig is crosspatch and the object of his ire is Jonathan Manley and Kingpin’s recent three-parter "We Need to Talk About Garry". To be honest, WNtTAG didn’t really do it for me. Don’t get me wrong, I’m perfectly willing to buy into the general thesis that How Life Imitates Chess is a load of old knolly and Gazza is not tremendous at recognising when he’s out of his depth. It’s just that the laying out of the detail of the argument in Andy Lewis’ articles left me a tad cold. It was OK. It was worth a read. No more than that, though. That said, I found We Need to Talk About Garry considerably more appealing than the protracted twitter-whinge that His Master’s Voice Mig Greengard produced in response. 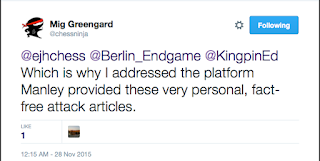 There’s a certain irony in Mig complaining about "paid trolls" and "fact-free" writing, I feel. Let us review the key moments of the Kasparovian subplot of these DG posts. ... and he has misrepresented the research paper’s conclusions (DG XXII). 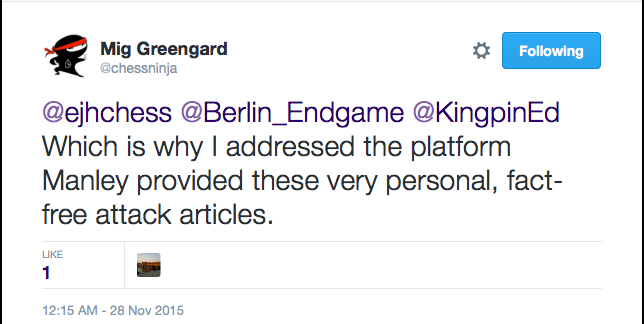 After all that, going large with a complaint about Kingpin’s supposed lack of facts seems rather out of place to me. * The bit about Down’s Syndrome is worth remembering. Dementia is what I happen to be interested in as it was my area so that bit of the tweet is what sparked a series of blog posts. The Down’s Syndrome claim is equally worthy of attention, of course. ** Making this commitment out of the blue and then not following through does rather give the impression that Mig was happy to make a promise that he had not the slightest intention of keeping. A year on, I find the whole thing rather curious. The motivation for Mig choosing to behave this way entirely escapes me. Small point - Down Syndrome or Down's Syndrome are both OK. Wikipedia prefers the former. Just as Asperger Syndrome and Asperger's Syndrome are both OK. Again, Wikipedia prefers the former, as do I. DSM5, of course, prefers neither. I only knew that CHESS was thought to be a valid predictor of mortality in neurological populations. Anyway, why not highlight these contraindicators? "Exercise may trump mental activity in protecting against brain shrinkage"
"Keeping mind, body active may not protect against underlying signs of Alzheimer's"